Recently I have been wanting to explore the realm of mixed media art. 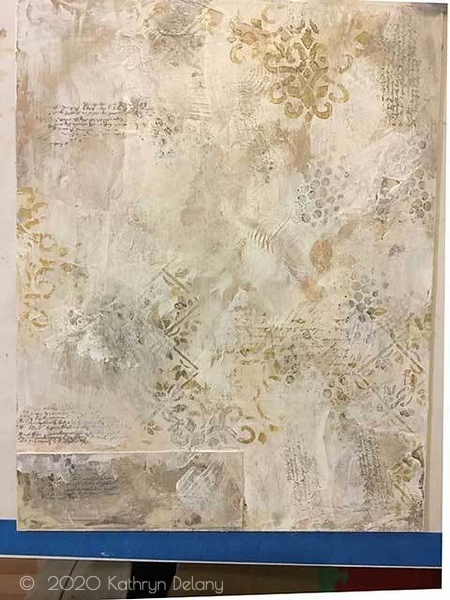 This incorporates collage and using different materials together. See my story on my first attempt at encaustic! This was an exercise to use a limited color palette and create an artwork that has neutral tones. I started off using an 11″ x 14″ gesso panel that has been in my artillery for too many years to count. It and a couple of smaller ones surfaced during my move. 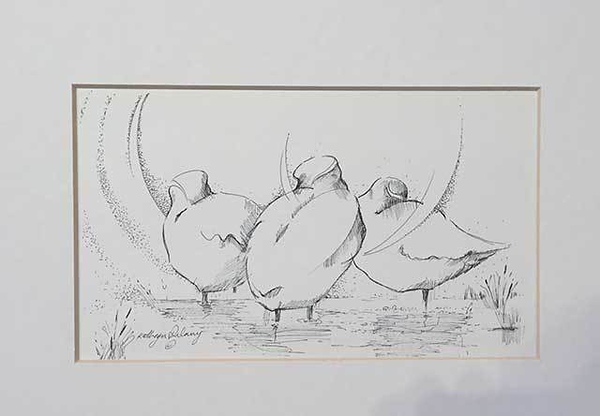 In my search for simple and strong images, I found this lovely pen and ink drawing I did many years ago in my stash. It appears I have a large stash of ‘stuff”! There is nothing more fear inducing for an artist than a blank white canvas! To get that fear out of the building, I started off by priming my surface with some Liquitex clear gesso. This stuff is amazing, it is clear yet once dried has has amazing ‘tooth’. In the artist’s world ‘tooth‘ means texture, or a surface that has the ability to hold paint media. Then I started in with some collage. I stamped a brown paper bookmark and glued that onto the surface, added different textures using gel and medium. What else is on this surface? 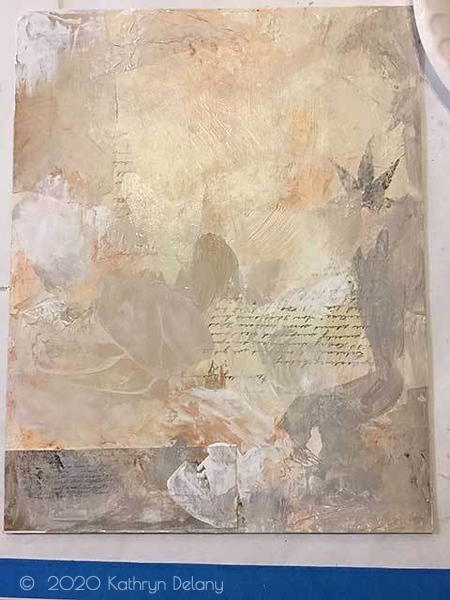 Tissue paper, smeared paints, a leaf embedded into paper, scraps of old letters. Then I started layering color, stamping and stenciling. The stages of development are fun to see, and I know for sure I will be using them as background textures or elements in some work in the future, whether is it digital or traditional. This was exciting and I almost called it done and done right here. So next step was to weave the story. 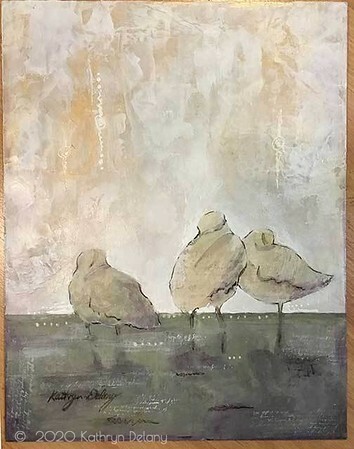 My ambition was to create a quite restful, yet isolated atmosphere for my 3 cold little water fowl. A low horizon line seemed right and I decided that everything underneath that horizon should become either very still water or frozen water. I wanted to create a sense of peace and companionship. I have always loved using iridescent paints, foils, metal leaf or metal paint in my work. As they say, a little bit of bling never hurts. So I added some gold metallic paint to the sky to give a lovely warm glow. I was pretty happy right here as well. To finish it off I trowled matte medium over the piece to give an added frosty feel and added softness to the work. I added a few highlights and squiggles and then figured it done. 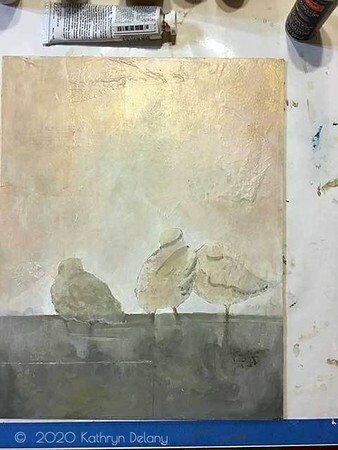 The goal was to portray a little bit of the feeling of isolation of the birds, the vastness of their universe and cold frozen water underneath them. However, the warm sky gives hope that a beautiful warm winter day is on its way. 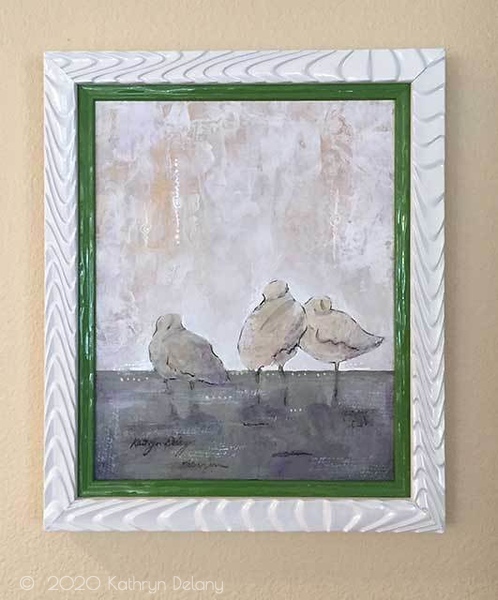 I then recycled a frame from another art piece and used it to frame this art in a modern, contemporary look. Glossy white! I like how the green in the painting is set off by the frame. What do you think? Let me know if you feel what I have described or something totally different in the comments below.